Heal the Bay is synonymous with the ocean. We surf it, we swim it, we dive it, we fish it, and we work day in and day out to make it cleaner, healthier and more productive for Southern California. But the ocean is just part of the picture: Our local wetlands, endangered and often overlooked, play a critical role in L.A.’s complex water story. Heal the Bay is proud to announce the next chapter in the goal of restoring these vital ecosystems. Heal the Bay has been steadfast in advocating for the protection and restoration of wetlands in the region. We supported the recently completed restoration project at Malibu Lagoon to improve its circulation, water quality and habitat. And now, various plans are currently being considered for the restoration of the Ballona Wetlands, a unique expanse of open space wedged between Playa del Rey and the Marina. Heal the Bay will carefully review a draft Environmental Impact Report, slated for release this winter, to determine which alternative we think will best bring back a thriving wetland ecosystem. To aid with this decision, Heal the Bay, along with a coalition of partners from Friends of Ballona Wetlands, L.A. Waterkeeper and Surfrider Foundation, will look to the Wetland Restoration Principles—a comprehensive, scientific set of guidelines developed by coalition members over the last year. This nine-tenet protocol establishes clear, practical guidelines for wetlands restoration projects in Southern California and beyond. 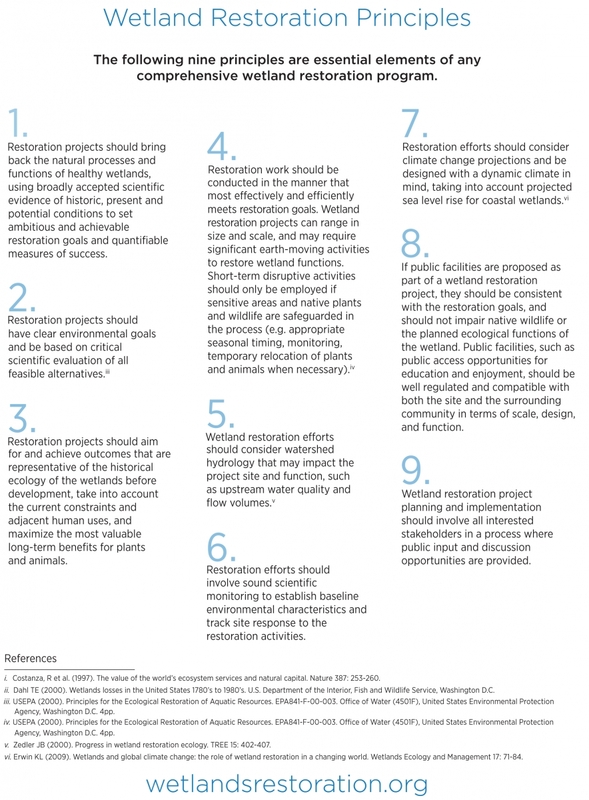 Scroll down or click for a downloadable, printable PDF of the Wetland Restoration Principles. A brief history of wetlands in L.A.
Wetlands, as the name suggests, are areas of land partially covered by water. Their value is incalculable: They provide nursery, shelter and feeding grounds for fish and wildlife, purify water through filtration of pollutants, recycle nutrients, and act as a buffer against the impacts of climate change by storing carbon from the atmosphere and protecting us from extreme weather. Unfortunately, as a result of urbanization, the channelization of natural waterways (the L.A. River being a prime example) and the impacts of pollution and invasive species, over 95% of Southern California’s wetlands have been lost. Those few that remain, like the Ballona Wetlands, have been greatly degraded and reduced in size. Under constant threat from human activity, the need to restore our remaining wetlands is urgent and essential. By creating the user-friendly, open-source Principles of Wetland Restoration document, we hope to make the future of these vital ecosystems a little less murky. Want to keep tabs on wetlands restoration efforts in your neck of the woods? Click below to join our mailing list.